On February 26, 2012, 17-year-old Trayvon Martin went out to buy some snacks at the nearby 7-Eleven. George Zimmerman, the neighborhood watch captain in a small gated community in Sanford, Florida, was driving around in his SUV. 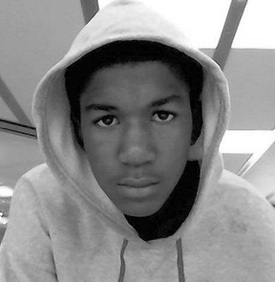 Zimmerman called 911, saying Martin looked “real suspicious”—i.e., he was a young Black male, walking around in a hoodie. After the 911 dispatcher told Zimmerman not to pursue the youth, Zimmerman followed Trayvon Martin, got out of his car and then confronted Martin. Zimmerman was carrying a 9-millimeter handgun. Trayvon Martin was carrying a bag of Skittles and a can of iced tea. There was yelling, then a gunshot. Trayvon Martin lay face down in the grass with a fatal bullet wound to the chest. Zimmerman was taken into custody, questioned and released. To this day, he has not been arrested and charged with any crime. It is very good and very important that people, not only in Sanford, Florida, but all over the country, are outraged by the murder of Trayvon Martin and are making their outrage known in many different and creative forms of protest. It is also important that, in connection with the murder of Trayvon Martin, the memory of Emmett Till—wantonly murdered by white supremacists decades ago—is being raised to express the fact that people have seen this go on for far too long and will not stand by to see it happen yet again. At the same time, the fact that yet another Emmett Till moment can arise—that yet another outrage of this kind can take place—today, more than 50 years after the original Emmett Till lynching, and that this murder of Trayvon Martin is not an isolated incident but only the latest of an endless chain of such acts that are perpetrated, condoned and covered up by the powers-that-be, shows very powerfully that, this time around, we must not settle for anything less than stopping this, once and for all—we must build a movement to really and finally put an end to these and countless other outrages that spew forth from this system, by sweeping away this system through revolution. This is deadly serious and we must take this up very seriously.